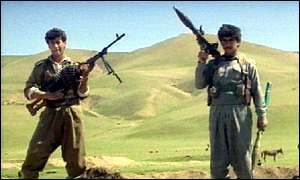 Wars A brief overview of political violence in Turkey and Kurdistan. Personalities Some information on powerful (or interesting) people in the region. TravelAn alternative Guide to Turkey. Media Links On-line media about Turkey and KurdistanLinks to political sites about Turkey and Kurdistan. Political Links Links to political sites about Turkey and Kurdistan. Peoples & CreedsSome information about the ethnic groups in Turkey, where they live, their languages and their religious practices. Links to official reports on Human Rights, travel advisories and articles. Go ahead, send me a death threat. This page is an attempt to provide an alternative guide to Turkey and Kurdistan, a guide which stresses the socio-political fabric of the country rather than beaches, ruins and what-not. This page stresses recent history rather than ancient history, who lives where rather than what is where. I am also including a comprehensive list of on-line resources regarding Turkey and Kurdistan. My intention is to provide foreign residents of Turkey with information about the country, information I hope will bring them out of their enclave environments and into the world in which the Turks, Kurds and other groups live. It is also aimed at those travelling to Turkey with an intent to either go off the beaten track or those who have an interest in Turkish/Kurdish politics and social issues. Most of the links I include here are from organisations dissenting from the governments of Turkey and Iraq, although I have also included a number of government and general media sites. This is an indication of the amount of heat in politics in this region -- not the author of this site's opinion. It is very difficult to get an accurate picture of Turkey and Kurdistan from any one source. Although deliberate misinformation is not uncommon, the sheer variety of viewpoints is staggering. Anyone serious about learning about this region should take their information from many different sources. Politics in Turkey are triangular rather than polar. Each point is opposed to the other two points, although temporary alliances of expediency are common. At the apex is the Kemalist Right which contains all the seated parties in parliament (currently the DYP, DSP, ANAP, FP, CHP, DTP, BBP) as well as various mafia/paramilitary organisations associated with the interior ministry. It can be argues that the MGK, the National Security Council comprising the chiefs of the armed services is also here, but they are really in a class of their own. The bottom right point of the triangle is the Islamic Right containing elements of the FP, as well as more underground organisations such as Hizbullah and the bizarre Federated Anatolian Islamic State. The bottom Left corner contains "legal" leftist parties such as the ODP, IP, SIP, Emep, HADEP in addition to illegal organisations such as the DHKP-C, TIKKO, PKK, TKP-ML, TKP(ML), TKP/ML and all the typical fractions one finds on the left everywhere. It is important to note that only the Kemalist Right has any proper representation or legal standing in the political system or, for that matter, any political power to speak of. The two non-Kemalist points are shut out by the fact that they do not follow Kemalist ideology and are generally banned or are harrassed. In recent years, the Kemalist Right and the Islamic Right have made common cause against the Left, but currently there are strong moves by the MGK to put the Islamic Right back out onto the fringe of the Turkish political dialogue. It can be said that the MGK, i.e. the military, is the only true power in the country. Some feel that parliamentary politics is just a sideshow to the monthly MGK meetings. The military in Turkey has staged coups three times in the last forty years and came very close to ousting Islamist Prime Minister Necmettin Erbakan by coup in June of 1997. The military is technically under the direction of the government in Ankara, but no one in Ankara has the spine to stand up to the military. In any case, the 1983 Constitution was largely written by the generals and it provides the military with a large degree of political autonomy. The military's position in Turkish politics is powerful, but also enigmatic, even anachronistic. 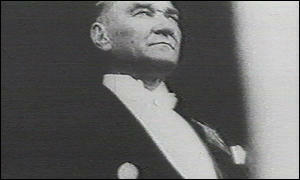 The military seeks to uphold the principles of Mustafa Kemal Ataturk who established the secular Turkish republic in 1923. Essentially the military wants to stop the clock or even roll it back to the days when the Republic was young and stuggling to make itself into a nation. It is not useful to think of Turkey as a nation state in the way one thinks of France or Holland. The polity is so fragmented in Turkey it is difficult to think of it as a nation at all. When asked as to their origins, almost everyone will answer with their home province rather than "Turkiye." And as a state, Turkey also leaves a lot to be desired. The government finds it impossible to collect taxes, control its police or army, maintain the integrity of the frontiers, pave roads, manage development, protect the environment or do anything practical to control maniac drivers. The government does very little governing, even less than in the United States. The true powers are the fascist organised crime syndicates allied with the national police who control more and more of the economy and have the clout to subvert or flout the government and justice system.